In St. Charles, IL, stunning river views, striking architecture and a relaxing neighborhood ambiance come together to create a small-town aesthetic that feels a world away. From a historic downtown dotted with tree-lined bars and restaurants to a wealth of natural parks and the Fox River, this charming haven truly has something for everyone. Here, you will find Ascend St. Charles, a garden-style apartment community spread across twenty-five acres of lush landscaping. Elegant interiors reflect thoughtful craftsmanship, while indulgent amenities promise to relax, pamper and inspire. Nestled in a coveted location near Chicago, these homes offer the ideal combination of suburban distinction and urban convenience. Surround yourself with modern refinement and sophisticated splendor as you tour the one and two bedroom apartments at Ascend St. Charles. From the moment you step inside, the homes transform into your own personal sanctuary thanks to luxe interior features ranging from oval soaking tubs and crown molding to gas fireplaces in select models. Honoring the surrounding area’s natural charms, the features and amenities at Ascend St. Charles emphasize a connection to the outdoors. Spacious patios and balconies allow you to experience views of the property’s exquisite landscaping and ponds. Additionally, a sand volleyball court, walking path and resort-style pool provide the ideal spaces to relax and enjoy the open air. 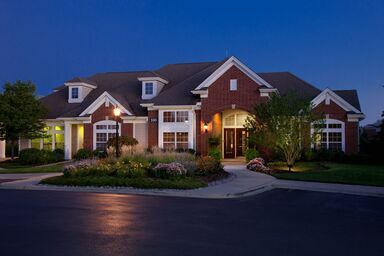 Situated just minutes from historic downtown St. Charles on the banks of the Fox River, the apartments for rent at Ascend St. Charles feature an unrivaled location near several renowned entertainment, shopping and dining venues. All the exciting attractions downtown Chicago has to offer are also easily within reach thanks to nearby Interstate 88 and the Metra commuter rail station.